The scientific method is a systematic set of principles and procedures for generating and representing knowledge as accurately as possible. Scientists use the scientific method as an orderly process to ask questions about phenomena and test the answers. The diagram below illustrates the scientific method. 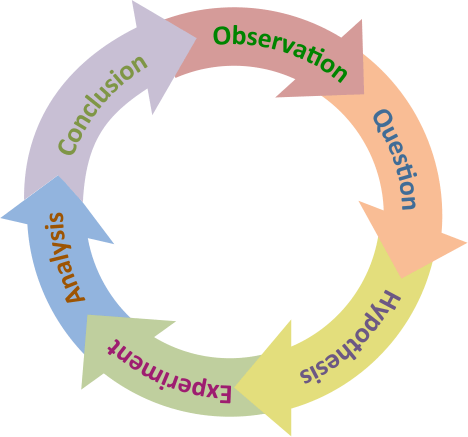 An illustration of the scientific method. Image is public domain. Observations lead to a question. Possible answers to this question are refined into one or more testable hypotheses. There are many ways to test each hypothesis such as experiments, mathematical analysis, and modeling. The results are analyzed to reach a conclusion that supports or rejects the hypothesis. This process can generate new observations that stimulate further investigations. Hypotheses must be rigorously and repeatedly tested before they are considered valid. Hypotheses that have been consistently validated through additional observations or experimentation can eventually be advanced to the status of theory. A theory is a thoroughly substantiated explanation of some aspect of the observable world. Examples of well-documented and widely accepted theories include plate tectonics theory and the theory of evolution. The publication process is one method used to maintain the quality of scientific research. The procedures, data, and conclusions are documented in a scientific paper and submitted for review by other scientists. This process is called “peer review.” If the scientific paper is approved by the reviewers, it is published so that others may review the results and, in some cases, attempt to replicate or disprove the conclusions. Being published does not guarantee that the conclusions are correct. Sometimes a paper is accepted, only to have its conclusions later contradicted or modified as new evidence emerges. Because of the importance of review in preventing the spread of false knowledge, all DOSITS content is based on well-understood scientific principles, peer-reviewed literature, and high-quality sources of scientific data.